Surpassing expectations, the Philippine economy grew by 6.9 percent in the third quarter from year-ago levels, up from the 6.7-percent growth rate it recorded in the preceding quarter, the Philippine Statistics Authority (PSA) reported. However, the third-quarter GDP growth rate was lower compared to the seven percent recorded in the same quarter last year. Driven by strong manufacturing, trade, real estate and renting-related business activities, the uptick in GDP made the country among the fastest-growing economies in the region. 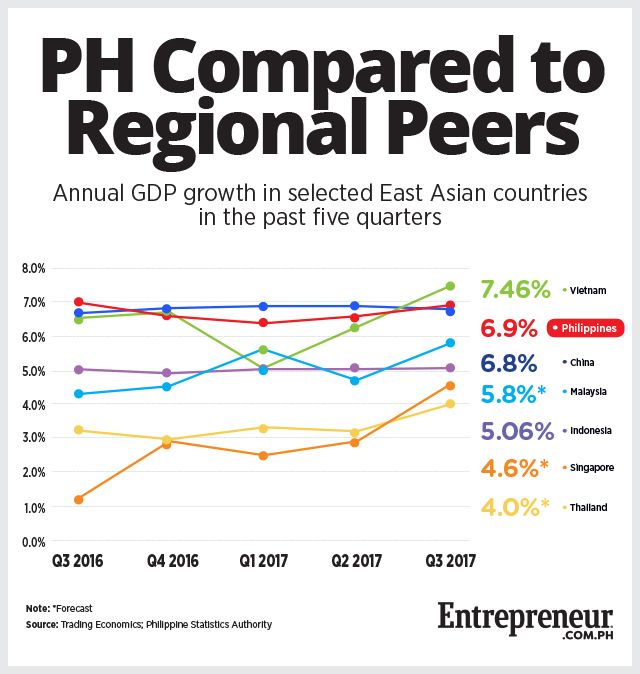 “The country is likely to be the second fastest-growing major Asian emerging economy in the third quarter after Vietnam and ahead of China and Indonesia,” said the National Economic and Development Authority (NEDA) in a statement. Vietnam posted a 7.5-percent GDP growth rate in the third quarter while China’s economy grew by 6.8 percent in the same period. Indonesia only recorded a 5.1-percent growth rate for the quarter while the other members of the ASEAN-5 have not yet released their economic data. Still, based on forecasts, the Philippines is seen to be at second place among its peers. “With a year-to-date growth average at 6.7 percent, we are confident that we are on track in meeting the full-year target range of 6.5 to 7.5 percent GDP growth for full-year 2017,” Socioeconomic Planning Secretary Ernesto M. Pernia said. Pernia said the expected holiday spending would likely boost the country’s economy in the last quarter. He also cited the government’s infrastructure program, which helped boost public construction at a time when private construction was slowing down. “We expect a pick-up in household consumption in the last quarter of the year due to the holiday season. Imagine if both public and private spending are both on a roll. We are likely to see the economy steadily going on an upward trajectory,” he added. This is also the second-highest GDP growth rate under the Duterte administration. The country recorded a seven-percent GDP growth rate in the same period last year, the highest under his term so far.